Most of your guests will not only be researching your hotel online but they could also be booking their stay there as well. 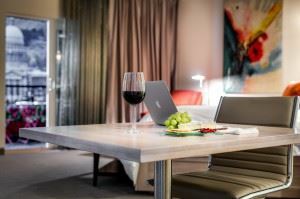 You can offer incentives for booking online such as a free room upgrade or a cocktail or appetizer in the hotel restaurant. That will certainly put your guest in a positive attitude even before they show up. It’s a good chance everyone staying at your hotel is on Facebook. This is a built-in audience that you should be advertising to. Whether you purchase targeted ads or post on a regular basis, you need to put Facebook to work for your hotel. As for the postings, you don’t want to always be selling. You can ask engaging questions about vacation memories or share packing tips. Anytime you can spark a conversation you’ll be ahead of the game. A hotel loyalty program is a lot like a frequent flyer program. You reward guests every time they come to stay at your hotel or make a booking for an out-of-town visitor. There are many mobile apps that set up automatic loyalty programs, which makes this an effortless endeavor. You get to determine what type of point you want to give away and what rewards there are. Even if your guests don’t cash in their points it still makes them feel as though they are being rewarded. Best thing you could do for your business is to keep up your high standards. By creating a positive experience for your customers you have the opportunity to get them to post rave reviews online. That will certainly generate a lot of business. It means responding quickly to customer concerns and keeping everything clean. While your housekeeping staff can take care the rooms, you can count on Junk King Sacramento to handle removal of the big stuff. These are the junk removal pros that will happily clear out your unwanted furniture, appliances and other hotel items. They’ll make sure these things are properly disposed of and allow you to advertise yourself as a green business. Bring in Junk King Sacramento to help keep your hotel clear of rubbish. This entry was posted in sacramento junk removal and tagged hotel, junk king sacramento, junk removal, rubbish on July 31, 2017 by Junk King. Last updated July 31, 2017 .